Graveyards are very important to genealogy. The first public graveyards didn't open until 1827, and prior to this date they were either church graveyards (graves were sometimes dug 30 feet deep to accommodate more bodies) or private graveyards, which came into fashion in the 18th century. The new public graveyards (the first was in Kensal Green in London) were called cemeteries, and soon became the norm around the country. An act in 1850 gave burial powers to local boards of health, and since then cemeteries have been the responsibility of local authorities. Finding where someone is buried is impossible from the Death Certificate itself. After the registrar issues a certificate of burial or cremation, it has to be returned within 14 days, showing where and how the body was disposed of (which can include cremation). However, the paper with that information is only retained for five years, so on a genealogy search years after the even that's no help. If you're intent on finding the burial plot of an ancestor, an Obituary can help, and so, sometimes, can a will. Failing those, you're faced with a long search through church graveyards and local authority cemeteries. You should also remember that many cemeteries have separate sections for different religions. There's one other important piece of information held at the cemetery, and that's the grave register. It tells you who owns the grave, when it was purchased, and who's buried in it. Where there's no gravestone, as if often the case, this can be an especially important piece of information towards your Family History. As a rule, cemeteries can be very helpful with a genealogy search, but you need to be able to provide them with enough information to find the grave or plot. Their registers aren't the same as death certificates, but do have a surprising amount about the deceased that can add to a genealogy. As well as the place in the cemetery, there's name, address, age, occupation, and dates of death and burial. Funeral directors or undertakers have been around professionally since 1688, but there are no written records before the early 19th century. By then their role was very similar to what it is today, not only arranging the burial, but helping to assemble all the necessary paperwork. In Victorian times, an undertaker covered a neighbourhood, so if you can't find the cemetery but do have the address where the person lived, it might be worthwhile checking the firm that was the nearest undertaker when in a family history. They tend to have chronological, rather than alphabetical, records, but those are generally much the same as you'll find at the cemetery. Not all keep records – they're certainly under no obligation to do so – and they're not required to let you look. However, with older burials you'll probably find many quite obliging if you tell them you're researching genealogy. After burial, the gravestone in the cemetery is the only physical reminder of the deceased. But the majority of those who've died aren't commemorated that way. Either there was nothing (in older times, gravestones cost money most families didn't possess) or the markers were of wood. Many gravestones have become illegible after centuries of weather. To find a grave, you'll need a map or register, which will be in the cemetery or churchyard. In the case of many churchyards, there's no such document. But, if you can find it, the gravestone can reveal a lot in genealogy. Sometimes family members are buried together, or an extended family might be buried next to each other. Always copy everything on the gravestone precisely, for it can help illuminate relationships, and for those buried before 1813, a stone might offer the only evidence of their age when they died – which is vital for a family history. Don't be astonished if you find no stone. Apart from the fact that most people don't have one, other factors come into play, too. It might simply not have survived, especially where churches have been extended, for instance. You'll be lucky to find one before 1700, and those from before 1600 are exceptionally rare. Most early stones are flat slabs, known as ledgers, and have often been eroded by wind and rain. It's a very valid point about not finding a grave marker in a church cemetery. Take a look around and you'll rarely find a legible one from before 1750 (there are a few exceptions, like the clear one from 1620 at Southwell Minster). 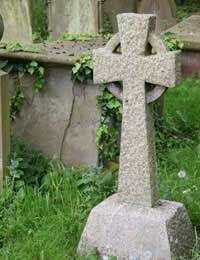 You'll be lucky if you can even find directions to where the grave might be, but searching can reveal a few interesting oddities, like the skill and crossbones gravestones at St. Mary's in Whitby. No names there sadly, and it's probably a memento mori, not the remains of a pirate!